Traders at an Anglesey indoor market have been evicted from their town hall venue as part of redevelopment plans. 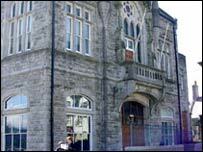 Stall-holders had been fighting Anglesey council plans to stop them using Llangefni Town Hall since October. The council allowed them to stay until Christmas, but they have now been told they are locked out for good. The council said the traders had been offered other pitches, and that the town would be regenerated. "It was an absolute wash out. We were locked out of the town hall and told we would not be allowed to trade there again," said stall-holder Storm Hutchinson who sells hand-made greetings cards. "We've now asked for a letter from the council explaining why we can't use the hall, because we still haven't been told anything (about the hall's redevelopment)." Ms Hutchinson said she was disappointed at the "very shabby treatment" of the stall holders by the council. "We have been offered stalls outside but that's not suitable for everybody as many of us sell perishable goods." Following the lock-out Ms Hutchinson said she was unsure what she would do next. "I'm feeling very low about the whole thing," she said. An Isle of Anglesey Council spokesperson said the council saw the redevelopment of Llangefni Town Hall as a means of regenerating the town centre. "An agreement for lease of the town hall building is now in the process of being exchanged, and as a result all market trading from the inside market hall has stopped," he said. The council understood the traders' "frustration", he added, but as an authority "we must act in the best interests of the town and wider community". "The redevelopment of the building, which is currently under-utilised, will generate fresh commerce and attract more people into the town." He confirmed traders had been offered stalls in the outdoor market.